Record established at Goodwood Festival of Speed, and has successively beaten 5 times during the weekend. Nissan present with other innovations of the brand at the Festival of Speed: JUKE-R, GT-R Track Pack, LEAF NISMO RC, GT-R GT1, besides the new Juke Nismo series. The Nissan LEAF, already won several awards, wrote this weekend a new chapter in the book of records by establishing successfully the car speed record running back, measure a distance of one mile (1.6 km) . 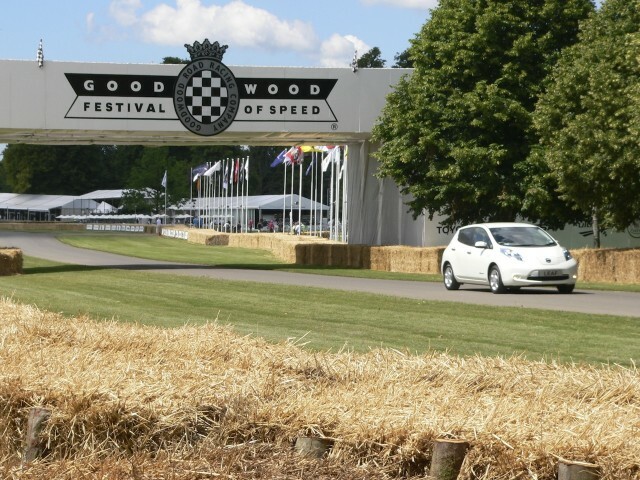 Pilotees by professional stuntman Terry Grant, the Nissan LEAF argument turned back the famous race odds Goodwood Festival of Speed ​​this weekend, covering the distance in 1 minute 37 seconds and two hundredths has average speed of 88.5 km / h.
Having established the record Friday, the opening day of the Festival, Terry has renewed his attempt Saturday and Sunday, gaining 26 seconds on the time he had realized on Friday. Comments Terry, who established last year's Festival a world record by performing the famous racing odds on two wheels driving a Nissan JUKE "I had in my hands a great car; the electric motor driving the wheels directly without gearbox, Nissan LEAF can in theory point at the same speed running back as well as forwards. At times, I really did not know where I was. However, thanks to its low center of gravity - the batteries being fully integrated into the floor - the LEAF proves extremely stable regardless of the direction of displacement. The only reservation I, for my part, it is the slight torticollis that I made a force constantly looking over my shoulder! ". The speed record LEAF running back is part of the ambitious campaign of Nissan social media, called "The Big Turn On". This operation aims, in just 100 days, promoting the message of the electric car has European scale by encouraging one million consumers, has to learn the electric driving, thanks to the communication channels of social networks. The goal of a million "turn on" was reached on June 21, with 15 days ahead of forecasts. The speed record running back of the Nissan LEAF Nissan was only one other event of the Festival. Nissan LEAF NISMO RC prepared for a hassle-proof competition against the clock (in a good way this time) to establish the speed record for electric cars racing odds. The car was driven by the winner of the FIA ​​GT1 2011, Michael Krumm, who also faces the race dimension driving his GT-R GT1 540 hp. The very latest GT-R Track Pack participated in the production Supercars Race, while the JUKE-R, the world's fastest Crossover, also regale the audience with his performance of hell. Festival goers were also able to discover the Juke Nismo series, Crossover on a vitamin designed by Nismo, Nissan sports preparer who enters it in showrooms early in 2013.